Darren Clarke Golf School Second Winter Training Camp At Desert Springs A Resounding Success! PGA Instructor Jack Murgatroyd first from left with 27 full time students from the Darren Clarke Golf School during their second visit to the Desert Springs Resort for a 4-day intensive winter training camp. That is the verdict of 17-year-old Natalie Goodhall, one of 27 full time students from the Darren Clarke Golf School based at Greenmount Campus, Northern Ireland, who have returned from their second visit to the Desert Springs Resort for a 4-day intensive winter training programme to develop their individual golfing skills. Darren Clarke Golf School PGA Instructors Jack Murgatroyd and Graham Mackay accompanied twenty five boys and two girls aged from 15 to 18 years for 4 days of warm weather winter training at the resort between 8th & 12th January, while experiencing a golf course, which offers a challenge to players at all levels. The training camp utilised the excellent practice facilities at the Desert Springs Golf Academy where Jack Murgatroyd and Graham Mackay were able provide one-to-one tuition for the students. The Desert Springs Golf Academy facilities utilized by the attendees of the Darren Clarke Golf School Winter Training Camp. 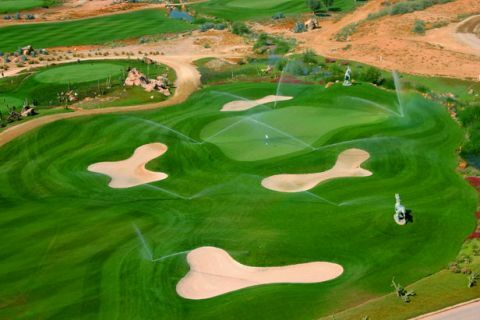 An aerial view of the 3rd Hole (Crazy Horse) at the Indiana golf course at Desert Springs, Europe’s only international award-winning luxury family resort and championship desert golf course in the Almanzora region of Almeria in south-east Spain. 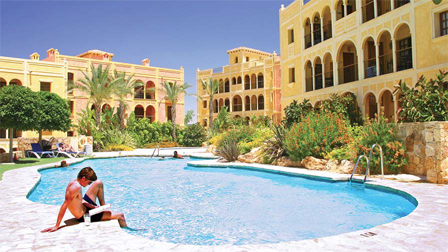 Accommodation for the Darren Clarke Golf School students and coaches was provided in the apartments available at Desert Springs. The Darren Clarke Golf School return to Desert Springs between 22nd – 29th January 2013 with 8 transition students and their coach Jack Murgatroyd for a seven day winter training camp. 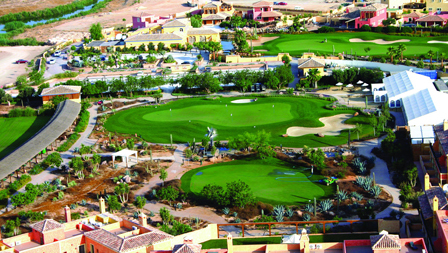 Desert Springs, Europe’s only international award-winning luxury family resort and championship desert golf course, is proving to be one of the most popular destinations for warm weather winter training camps among the growing number of schools with their own golf academies and teams, currently estimated at around 90 in the UK. In addition to Darren Clarke Golf School pupils, visiting groups have included golfing pupils from, Millfield School, Reading Blue Coat School at Sonning-on-Thames, King Edward’s School in Bath and Loretto School at Musselburgh near Edinburgh.